Hedge fund managers like David Einhorn, Dan Loeb, or Carl Icahn became billionaires through reaping large profits for their investors, which is why piggybacking their stock picks may provide us with significant returns as well. Many hedge funds, like Paul Singer’s Elliott Management, are pretty secretive, but we can still get some insights by analyzing their quarterly 13F filings. One of the most fertile grounds for large abnormal returns is hedge funds’ most popular small-cap picks, which are not so widely followed and often trade at a discount to their intrinsic value. In this article we will check out hedge fund activity in another small-cap stock: CACI International Inc (NYSE:CACI). CACI International Inc (NYSE:CACI) has seen an increase in activity from the world’s largest hedge funds of late. At the end of the third quarter there were 20 bullish hedge funds on this stock, up from 14 in the previous quarter. Among these shareholders there weren’t that many billionaires and the stock didn’t make on to the list of 30 stocks billionaires are crazy about: Insider Monkey billionaire stock index. However, seeing the recent enthusiasm for this stock, we would like to analyze it further. While gathering more information about CACI International Inc (NYSE:CACI) we tracked down Horizon Kinetics’ 3rd Quarter Commentary , in which this employee owned investment manager discusses the stock. We bring you that part of the letter. “CACI is a defense electronics company that provides information technology (IT) and professional services predominantly to the U.S. federal government and federal agencies. Two thirds of sales are from the Department of Defense, which includes the various Armed Forces and classified Dept. of Defense customers. Another quarter are from Federal Civilian customers such as the Dept. of Homeland Security and the Department of Justice. CACI focuses on data integrity and information, command and control, cyber security, surveillance and reconnaissance, and intelligence. The demand for its services is mostly created by the increasingly complex network, systems and information environment in which governments and businesses operate, and the need to stay current with emerging technology while increasing productivity. There are a handful of companies in this sector, most clustered in the Virginia area near the Pentagon, and often referred to as the “Beltway Bandits.” They have grown steadily over the decades, with a generous helping of strategic acquisitions. A not-small portion of their business is classified, and not clearly visible in the financial statements. A cyclical aspect of their environment is that many of the programs a company like CACI might work on were denied full funding during the prior two Washington administrations. The present one is increasing funding for defense. Knowing this, one would expect that, unlike the typical consumer products or industrial business, these companies are not subject to the generalized business cycle. This is not to say they are without cyclicality, but it is a different set of perturbations. That is one factor that makes them diversifiers in a portfolio. Also, because of the necessary secrecy surrounding these services, the government prefers to only deal with a handful of companies, which limits competition relative to what the average industrial or technology company faces. One could say the same about any defense company. But there is a difference between the traditional S&P 500 defense contractors like Raytheon, General Dynamics, Lockheed Martin and United Technologies, all with market caps above $50 billion, and CACI and SAIC – $4 billion and $3 billion, respectively. There is a difference in the scalability of their businesses, in terms of market share expansion, and in terms of the preference for military programs that will be more effective for the dollars expended in the event of budget constraints—think unmanned drone program versus a new stealth bomber program. And in the capacity to expand through acquisition without regulatory anti-trust constraint. If one wanted to see how a company like this might fare during a cyclical downturn, then the Credit Crisis is a handy reference. Between 2006 and 2009, the revenues of the S&P 500 declined by 4.6% on a per- share basis. CACI’s revenues rose by 59%. The S&P 500 earnings declined by 42% between 2006 and 2009. For CACI, the figure was up 8%. On a longer-term basis, the 12-year revenue growth for the S&P 500, from the pre-crisis year of 2006 through 2018, was 2.7% per year, while CACI revenues expanded by 10.0% per year on a per-share basis. S&P 500 earnings were up 1.6% per year, and CACI’s by 13% per year. Continuing with our analysis we are going to take a look at the latest hedge fund action surrounding CACI International Inc (NYSE:CACI). What does the smart money think about CACI International Inc (NYSE:CACI)? At Q3’s end, a total of 20 of the hedge funds tracked by Insider Monkey held long positions in this stock, a change of 43% from one quarter earlier. 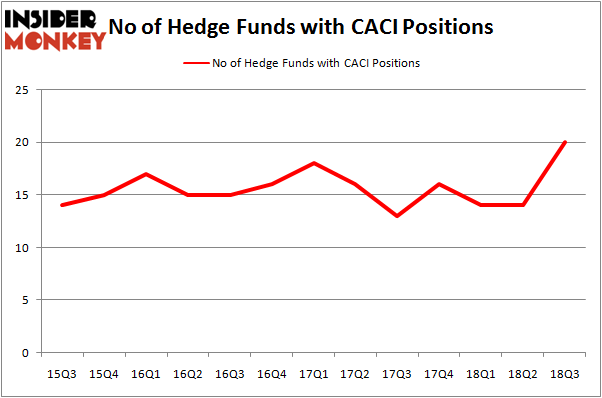 On the other hand, there were a total of 16 hedge funds with a bullish position in CACI at the beginning of this year. So, let’s find out which hedge funds were among the top holders of the stock and which hedge funds were making big moves. Among these funds, Horizon Asset Management held the most valuable stake in CACI International Inc (NYSE:CACI), which was worth $32.8 million at the end of the third quarter. On the second spot was GLG Partners which amassed $26.2 million worth of shares. Moreover, Renaissance Technologies, Marshall Wace LLP, and AQR Capital Management were also bullish on CACI International Inc (NYSE:CACI), allocating a large percentage of their portfolios to this stock. As industrywide interest jumped, specific money managers have been driving this bullishness. 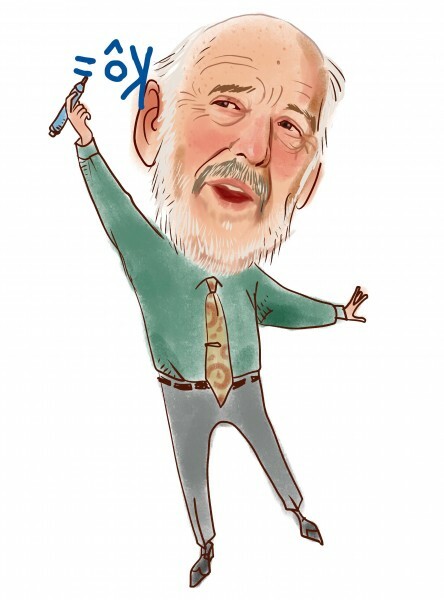 Renaissance Technologies, managed by Jim Simons, established the most outsized position in CACI International Inc (NYSE:CACI). Renaissance Technologies had $9.7 million invested in the company at the end of the quarter. Paul Marshall and Ian Wace’s Marshall Wace LLP also made a $5.8 million investment in the stock during the quarter. The other funds with new positions in the stock are Peter Rathjens, Bruce Clarke and John Campbell’s Arrowstreet Capital, Matthew Hulsizer’s PEAK6 Capital Management, and George Hall’s Clinton Group. Let’s go over hedge fund activity in other stocks – not necessarily in the same industry as CACI International Inc (NYSE:CACI) but similarly valued. We will take a look at Trex Company, Inc. (NYSE:TREX), Cameco Corporation (NYSE:CCJ), Oasis Petroleum Inc. (NYSE:OAS), and Pilgrim’s Pride Corporation (NASDAQ:PPC). This group of stocks’ market values match CACI’s market value. As you can see these stocks had an average of 21 hedge funds with bullish positions and the average amount invested in these stocks was $352 million. That figure was $97 million in CACI’s case. Oasis Petroleum Inc. (NYSE:OAS) is the most popular stock in this table. On the other hand Pilgrim’s Pride Corporation (NASDAQ:PPC) is the least popular one with only 16 bullish hedge fund positions. CACI International Inc (NYSE:CACI) is not the least popular stock in this group but hedge fund interest is still below average. This is a slightly negative signal and we’d rather spend our time researching stocks that hedge funds are piling on. In this regard OAS might be a better candidate to consider a long position.